He has posted a review of the core book, and will be following it with a review of the supplement, Resistance. You can see the full review on his site, but here are a couple of quick quotes. “WHAT WORKS: The presentation is fantastic. There’s a lot of information in here, but it never feels overbearing. The art is well-done and well-placed, never dominating the book but adding appropriate flavor. 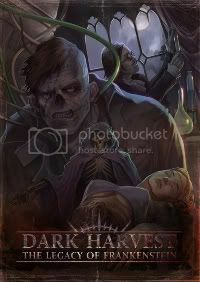 The setting is quite disturbing, with the wealthy preying off of the poor in a most unique manner, and the horrors of Frankenstein’s machinations revealed in excruciating detail. The sealed off nature of Promethea also allows for extra intensity in setting that might not be there in a more “open” environment. “WHAT DOESN’T WORK: The health system seems unnecessarily complicated. I probably would have liked more Talents, but with Augmentations, Assets, Privileges and Contacts, there are more options there than it appears on the surface. Perhaps my biggest gripe with the setting is that, as cool as it is, it seems to be building to a Frankenstein vs Creature encounter (okay, it says so a few times), and that seems like it would exclude the PCs from playing the major role in the future of Promethea.